Abu Dhabi, UAE, 10th January 2019: Team Z7's Shane Breen landed the €25,000 Meadow Court Stud Presents Grand Prix Qualifier, the feature class on the opening day of the CSI4* Al Shira'aa International Horse Show yesterday with Can Ya Makan. Shane Breen continues his run of spectacular form after landing the four star Grand Prix in Liverpool, England and victory in the Champagne Taittinger 150cm class at London's Olympia in December. Breen, who has won the class for the second consecutive year, will now go through to the €62,000 Longines Al Shira'aa Grand Prix on Saturday along with with the top-25 riders from the class. Just 12 of 49 starters rode clear in the 145cm opening round to earn a spot in the jump off. Among them were highest-ranked rider, and defending champion, the world number eight, Henrik Von Eckermann from Sweden, Saudi Arabia's Abdullah Sharbatly, Germany's Jorge Naeve, Janika Sprunger from Switzerland and Philipp Weishaupt of Germany. Eckermann, who won the Grand Prix in 2018, was first to go on Que Bueno De Hus and his fast yet careful round in a time of 38.77sec set a high standard for the rest. Russia's Vladimir Tuganov couldn't better his mark, riding Qualidam to a 39.80sec clear and Von Eckermann looked safe until Weishaupt entered the arena. His smooth clear in a time of 38.05sec saw him overtake his Swedish rival and he remained untroubled at the top of the scoreboard until Breen and Can Ya Makan took their turn in the arena. Their time of 37.11sec was just too fast for the rest and none of the remaining riders could better either Weishaupt, Von Eckermann or Tuganov's efforts. Breen, a multiple Olympic rider, said he was looking forward to the Grand Prix on Saturday. The third class of the day, the YAS TV Speed Stakes, chalked up another win to the UAE with Mohammed Al Hajri and Doklahoma VDL finishing in a time of 57.66sec and beating Italian Emilio Bicocchi and Faliane W into the runner-up position by more than two seconds. Ahmed Mansour of Jordan was third on Estoril de Vardag in a time of 60.02sec. 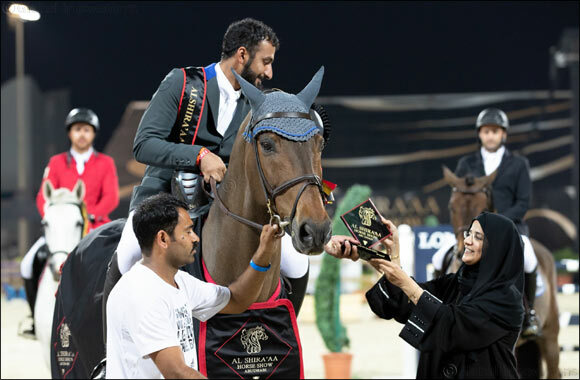 Earlier in the day Salim Ahmed Al Suwaidi had claimed the opening Cavalor Young Horse Welcome Stakes with Diamond Way meaning that UAE riders won two out of four classes on the opening day of the show. Saudi Arabia's Abdulrahman Alnemr won the Al Shira'aa UK Prize on Beverly Girl. The Al Shira'aa International Horse Show will feature the region's first Derby class on Friday and concludes with the world-ranking points qualifier on Saturday.